Three Historical Periods of Jewish Law. High Development of Talmudic Law. The development of thousands of years is represented by the Jewish law asit is found in the Shulḥan 'Aruk, Ḥoshen Mishpaṭ, of Joseph Caro (16th cent. ), as well as in numerous other works which elaborate or elucidate individual passages in various ways. The history of the Hebrew code falls into three chief epochs: (1) the Pentateuch, (2) the Talmud, and (3) post-Talmudic literature. The Pentateuch forms the basis of the Talmud, while the latter serves in its turn as a foundation for post-Talmudic law, which has tenaciously maintained its validity in less cultured countries to the present day. Although these three periods are closely related in so far as the later epochs were developed from the earlier, they must be regarded as mutually independent, since they represent different phases of evolution. As controverting the theory which formerly prevailed, especial stress must be laid upon the fact that in the course of time the changes both in material and in spiritual life profoundly modified Jewish law, the stages of whose evolution are linked together only by the legal fictions common to all history of law. It may accordingly be said that there were three judiciary systems: the Mosaic, the Talmudic, and the rabbinic. 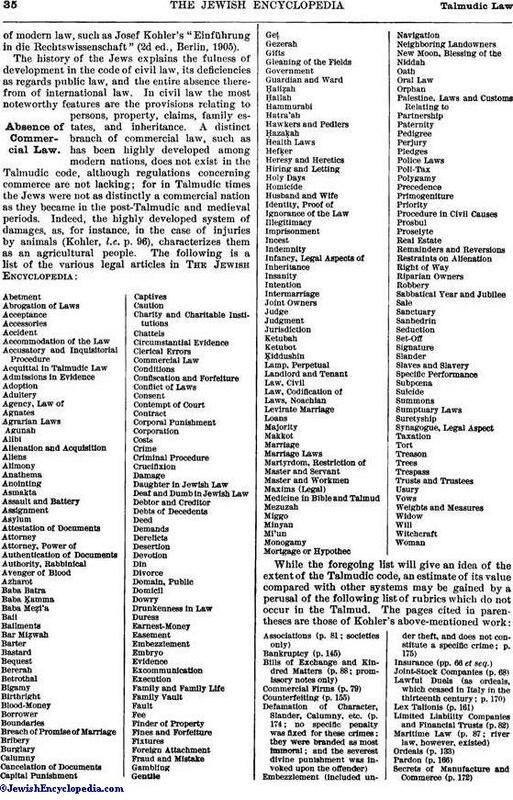 The Talmudic code is generally termed the "Mosaic-Talmudic," since the authorities of the Talmud took the Mosaic law as their basis. From the point of view of judicial history, however, the Talmud must be regarded as an independent structure; and it is therefore more correct to use the simple term "Talmudic law." The present article excludes all reference to rabbinic law, and discusses only those aspects of the Mosaic system which facilitate an intelligent comprehension of the Talmudic code. The Torah, revealed by God, was the basis of the code; and God Himself was consequently the Supreme Source of law. The Talmud, like the Torah, drew no distinction between religious and secular law, thus conforming to the general custom of ancient peoples, especially in the East. One result of this peculiarity was the wide range and close articulation of the Talmudic system, since the commandments of religion influenced secular law, and modified civil relations in so far as any infraction of them was punishable. It is impossible, therefore, to differentiate sharply between religious and secular law. Everything pertaining to the former is discussed more properly under Halakah, and is, therefore, omitted here so as to render possible a brief outline of secular jurisprudence and a citation of parallels with other systems. While the application of modern legal categories to Talmudic law is foreign to its nature, it can not be avoided; a careful check, however, must be kept upon this method. In like manner a careful distinction must be drawn between the civil and the penal codes of Talmudic law. While the civil code was actually enforced, the penal code was a dead letter; for the Romans, about 30 C.E., had withdrawn all criminal jurisdiction from the Jews (Sanh. 41a; Yer. Sanh. i. 1, vii. 2; Mommsen, "Römische Geschichte," v. 512). After the destruction of the Temple, in the year 70, jurisdiction in civil cases as well seems to have been given to the Roman courts (Mommsen, l.c. p. 548; Frankel, "Der Gerichtliche Beweis nach Mosaisch-Talmudischem Rechte," pp. 45, 142; idem, "Zeitschrift für die Religiösen Interessen," i. 153, 189), although this can have been only a temporary measure, and, in view of the power possessed by the parties involved to refuse to submit to such a court, can never have been rigidly enforced. Civil jurisdiction may be regarded, therefore, as a right which really existed, while criminal law was, for the most part, merely theoretical from the very beginning. Survivals from the period of independence, Pentateuchal laws, and the penal codes of foreign rulers are the component elements of the criminal law of the Talmud. Very frequent, moreover, are the instances in which exegeses of Biblical passages served as sources, often elucidating laws which were never actually enforced. The origin of the Talmudic penal code explains the majority of its peculiarities as well as its weaknesses and its merits. The merits consist chiefly in leniency. Thus, for example, while the code recognized capital punishment and the frequency of its infliction as ordered by the Pentateuch, it rendered the death-sentence practically impossible, since this penalty was so conditioned by requirements of proof of malice afore-thought that finally guilt could no longer be proved. Capital punishment, even for murder, was so abhorrent to the authorities of tradition that its infliction was to be prevented by all legal means (Mak. i. 10 et passim). In view of these circumstances and principles, the penal law in general and its theoretical development in particular aimed at strengthening moral consciousness and at rousing a sense of guilt. In like manner, the punishments inflicted were mild. Thus, a thief was obliged to return twice the value of the stolen goods, while early Roman law visited a thief caught in the act with a terrible penalty, which was extended under the empire to other forms of theft as well. The Germans frequently punished theft with death or at least with amputation of a hand or a foot. The impetus to the development of the Talmudic code was given by the study of the divine law, the precepts of which had to be expounded and elucidated even to the least dot on the smallest letter. No other people ever honored its national literature so highly or guarded it so carefully as the Jews did the teachings of Moses. Numerous scholars of the Law consequently arose, who may be regarded as jurists both individually and collectively. Every place of any size had its bet ha-midrash, where men of all vocations gathered daily for discussions. The result of five centuries of this activity was the Talmudic code. The civil law was intelligible even to laymen, and it was, moreover, interpreted by scholars; consequently its development was essentially practical, not merely theoretical as was that of the criminal code. These scholars, all working without compensation, evolved a legal system which in scope and excellence stands far above the period of civilization for which and in which it was created. The wealth of Talmudic law and its comparative freedom from defects are best seen when it is compared with a compendiumof modern law, such as Josef Kohler's "Einführung in die Rechtswissenschaft" (2d ed., Berlin, 1905). The penal code made no provision for a public prosecutor or for torture, although the latter was employed in Europe until the last quarter of the eighteenth century. A few examples will serve to show the lofty standard of the civil and marriage codes of the Talmud. According to Talmudic law, the agent was equal in all respects to the party he represented; and the Jews even allowed betrothal, itself a contract, to take place by proxy (ib. p. 32). On this subject Kohler says (l.c. p. 27): "Representation is an institution of elaborate development, introduced at a comparatively recent period by legal regulation. It is a creation of the highest type, rendering it possible for one to own a fortune of millions without having to administer it in person." 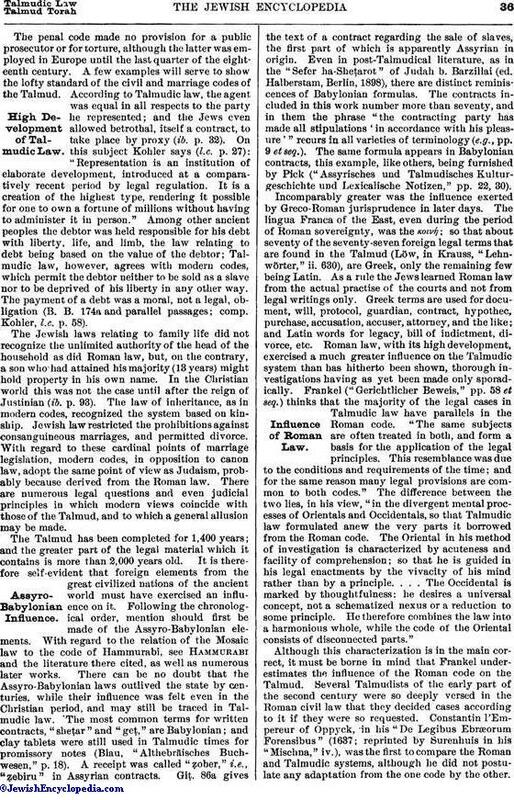 Among other ancient peoples the debtor was held responsible for his debt with liberty, life, and limb, the law relating to debt being based on the value of the debtor; Talmudic law, however, agrees with modern codes, which permit the debtor neither to be sold as a slave nor to be deprived of his liberty in any other way. The payment of a debt was a moral, not a legal, obligation (B. B. 174a and parallel passages; comp. Kohler, l.c. p. 58). The Jewish laws relating to family life did not recognize the unlimited authority of the head of the household as did Roman law, but, on the contrary, a son who had attained his majority (13 years) might hold property in his own name. In the Christian world this was not the case until after the reign of Justinian (ib. p. 93). The law of inheritance, as in modern codes, recognized the system based on kinship. Jewish law restricted the prohibitions against consanguineous marriages, and permitted divorce. With regard to these cardinal points of marriage legislation, modern codes, in opposition to canon law, adopt the same point of view as Judaism, probably because derived from the Roman law. There are numerous legal questions and even judicial principles in which modern views coincide with those of the Talmud, and to which a general allusion may be made. The Talmud has been completed for 1,400 years; and the greater part of the legal material which it contains is more than 2,000 years old. It is therefore self-evident that foreign elements from the great civilized nations of the ancient world must have exercised an influence on it. Following the chronological order, mention should first be made of the Assyro-Babylonian elements. With regard to the relation of the Mosaic law to the code of Hammurabi, see Hammurabi and the literature there cited, as well as numerous later works. There can be no doubt that the Assyro-Babylonian laws outlived the state by centuries, while their influence was felt even in the Christian period, and may still be traced in Talmudic law. The most common terms for written contracts, "sheṭar" and "geṭ," are Babylonian; and clay tablets were still used in Talmudic times for promissory notes (Blau, "Althebräisches Buchwesen," p. 18). A receipt was called "ẓober," i.e., "ẓebiru", in Assyrian contracts. Giṭ. 86a gives the text of a contract regarding the sale of slaves, the first part of which is apparently Assyrian in origin. Even in post-Talmudical literature, as in the "Sefer ha-Sheṭarot" of Judah b. Barzillai (ed. Halberstam, Berlin, 1898), there are distinct reminiscences of Babylonian formulas. The contracts included in this work number more than seventy, and in them the phrase "the contracting party has made all stipulations 'in accordance with his pleasure'" recurs in all varieties of terminology (e.g., pp. 9 et seq.). The same formula appears in Babylonian contracts, this example, like others, being furnished by Pick ("Assyrisches und Talmudisches Kulturgeschichte und Lexicalische Notizen," pp. 22, 30). Incomparably greater was the influence exerted by Greco-Roman jurisprudence in later days. The lingua Franca of the East, even during the period of Roman sovereignty, was the κοινή; so that about seventy of the seventy-seven foreign legal terms that are found in the Talmud (Löw, in Krauss, "Lehnwörter," ii. 630), are Greek, only the remaining few being Latin. As a rule the Jews learned Roman law from the actual practise of the courts and not from legal writings only. Greek terms are used for document, will, protocol, guardian, contract, hypothec, purchase, accusation, accuser, attorney, and the like; and Latin words for legacy, bill of indictment, divorce, etc. Roman law, with its high development, exercised a much greater influence on the Talmudic system than has hitherto been shown, thorough investigations having as yet been made only sporadically. Frankel ("Gerichtlicher Beweis," pp. 58 et seq.) thinks that the majority of the legal cases in Talmudic law have parallels in the Roman code. "The same subjects are often treated in both, and form a basis for the application of the legal principles. This resemblance was due to the conditions and requirements of the time; and for the same reason many legal provisions are common to both codes." The difference between the two lies, in his view, "in the divergent mental processes of Orientals and Occidentals, so that Talmudic law formulated anew the very parts it borrowed from the Roman code. The Oriental in his method of investigation is characterized by acuteness and facility of comprehension; so that he is guided in his legal enactments by the vivacity of his mind rather than by a principle. . . . The Occidental is marked by thoughtfulness: he desires a universal concept, not a schematized nexus or a reduction to some principle. He therefore combines the law into a harmonious whole, while the code of the Oriental consists of disconnected parts." Although this characterization is in the main correct, it must be borne in mind that Frankel under-estimates the influence of the Roman code on the Talmud. Several Talmudists of the early part of the second century were so deeply versed in the Roman civil law that they decided cases according to it if they were so requested. Constantin l'Empereur of Oppyck, in his "De Legibus Ebræorum Forensibus" (1637; reprinted by Surenhuis in his "Mischna," iv. 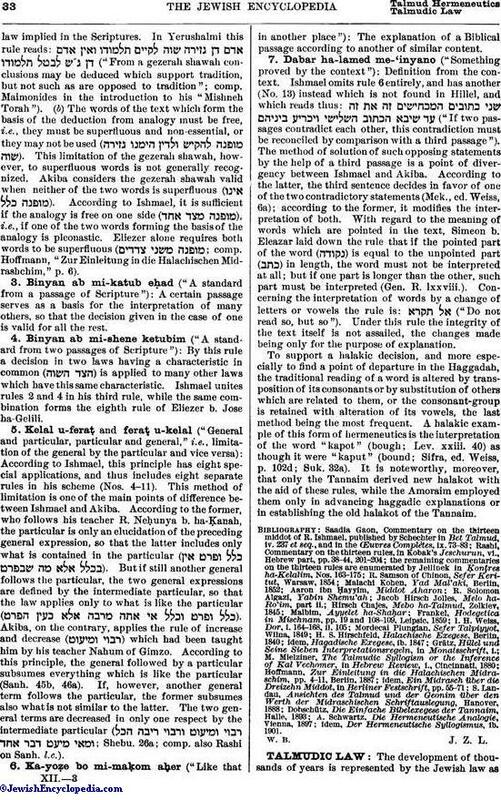 ), was the first to compare the Roman and Talmudic systems, although he did not postulate any adaptation from the one code by the other.Subsequently Zunz ("Etwas über die Rabbinische Litteratur," 1818), Jost ("Gesch." iv. 144, and appendix), Frankel (l.c. ), Krochmal ("Moreh Nebuke ha-Zeman," 1845), and others (comp. Blau, "Concursus Vitiorum" [in Hungarian], pp. 8, 11, 13) made similar comparisons. The Jews lived for a time both under the ancient Persian régime of the Achæmenidæ (550-330 B.C.) and under the neo-Persian dynasty of the Sassanids (250-500 C.E.). Persian law has, therefore, also been a factor, although the present knowledge both of the Achæmenian and the Sassanid codes is insufficient for an estimate of the extent of their influence on the Jews. The Talmud, on the other hand, characterizes the legal system of the Sassanids as a superficial one, and quotes some extracts in support of its assertions, e.g., the creditor may seize the security (B. B. 173, borrowed from Turkish law). See further Frankel, l.c. p. 56, where the theory is advanced that Sassanid law influenced the code of the Babylonian Talmud. 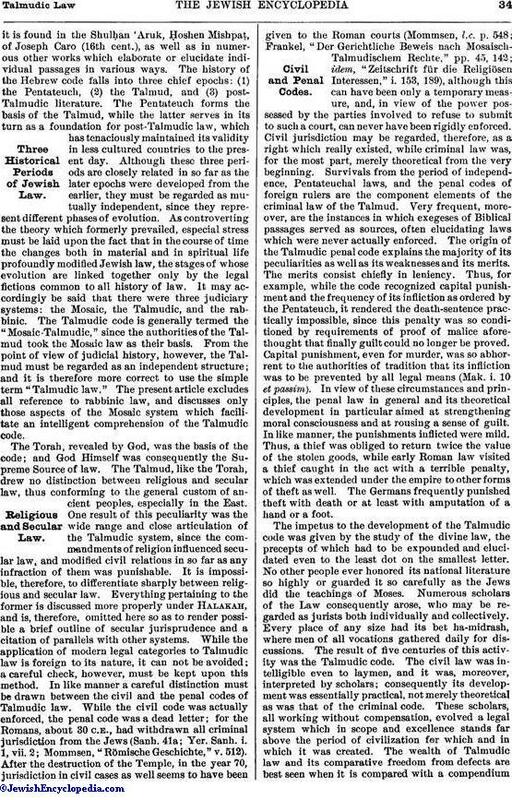 Among the compilations of Talmudic law, the "Mishneh Torah," or religious code, of Maimonides took a foremost place. Superior in system and arrangement to its predecessors and successors alike, even though its author did not codify the law of the Talmud in the strict sense of the term, but only the rabbinicolegal system as formulated at the time, it served as an authority for subsequent centuries. The Christian literature on the subject in the sixteenth and seventeenth centuries, and, to a great extent, even the modern literature of the nineteenth century, are dependent upon this work, even in cases where the treatises are termed "Mosaic-Talmudic." 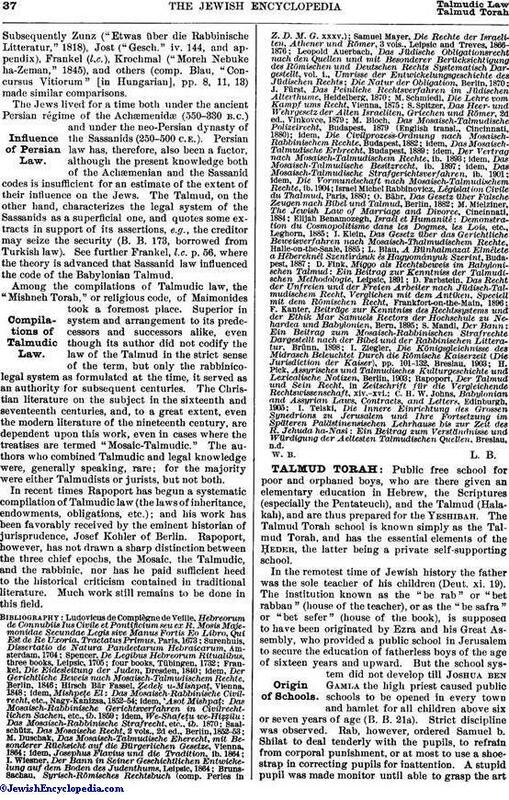 The authors who combined Talmudic and legal knowledge were, generally speaking, rare; for the majority were either Talmudists or jurists, but not both. In recent times Rapoport has begun a systematic compilation of Talmudic law (the laws of inheritance, endowments, obligations, etc. ); and his work has been favorably received by the eminent historian of jurisprudence, Josef Kohler of Berlin. Rapoport, however, has not drawn a sharp distinction between the three chief epochs, the Mosaic, the Talmudic, and the rabbinic, nor has he paid sufficient heed to the historical criticism contained in traditional literature. Much work still remains to be done in this field. I. Telski, Die Innere Einrichtung des Grossen Synedrions zu Jerusalem und Ihre Fortsetzung im Späteren Palästinensischen Lehrhause bis zur Zeit des R. Jehuda ha-Nasi: Ein Beitrag zum Verständnisse und Würdigung der Aeltesten Talmudischen Quellen, Breslau, n.d.